1. What is cycle syncing? 2. Why could cycle syncing be beneficial for someone with PCOS? 3. What kind of behaviours can you expect during each phase? 4. Is it ok/normal to give in to cravings during PMS? What food can we eat instead to have a somewhat balanced mood? 5. What are some of the nutritional foods that can be consumed during each cycle? 6. What about bad menstrual cramps? Will cycle syncing help? 7. What is the fat intake like? Usually, a high-fat low carb diet is prescribed for women with PCOS. Would it follow the same path in terms of a cycle syncing diet? Have you heard that you could reverse PCOS with cycle syncing? If you’re a fellow PCOS sufferer like me, then you know the frustration of painful periods. The cramps are endless and often debilitating. Sometimes you might not even get your period at all! I once when to a gynaecologist and she told me that as long as I get my periods, I shouldn’t be too concerned about PCOS not working out. One of the dieticians I consulted recommended keto. I’ve heard so much information and shared my journey with some amazing ladies in my PCOS group. 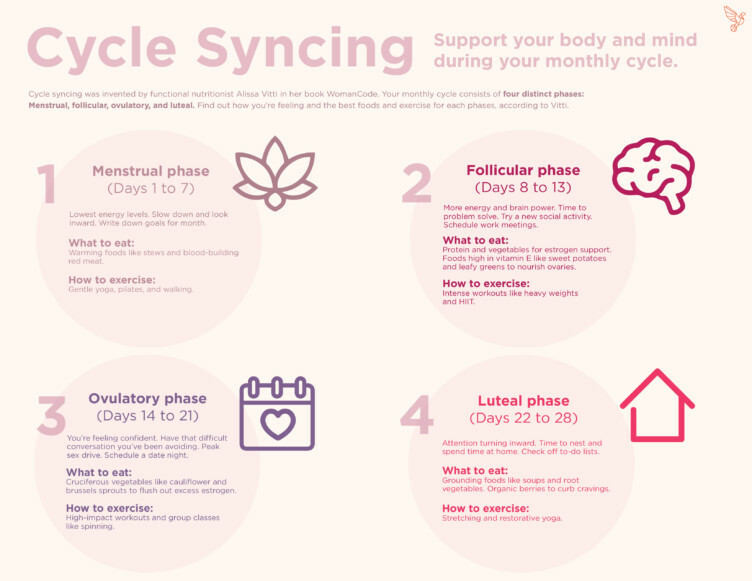 “Cycle Syncing is when you sync your diet, exercise routine, social calendar and even important work engagements to the four phases of your monthly menstrual cycle.” says Krystal. Please note that not all of the foods suggested could be beneficial to someone who has PCOS. For a PCOS diet, a high fat, paleo-based diet would be ideal. “Cycle Syncing can be very beneficial for someone with PCOS because it is the only diet/lifestyle that is safe for women’s hormones. It’s one that responds to your hormonal fluctuations each and every week in real time,” says Krystal. Since PCOS is a direct cause of out of whack hormones, you can reverse PCOS with cycle syncing. When I say reverse, I don’t mean cure. There is no permanent cure for PCOS, even though recently scientists have claimed they have found a solution for it. I believe that by the time the drugs make it through a trial and the relevant authorities, there is a huge chance it will be atleast 5 years down the line. Till then, lifestyle management seems to be a way to manage these PCOS symptoms. Cycle syncing is one way that won’t wreak havoc on your hormones. I tried keto as well as high fat and low carb and it failed. On consulting with an amazing nutritionist (more on that in my next posts), I found out that a lot of women do not adapt to high fat diets well. That includes me. The fact that I have Hashimoto’s doesn’t help either. 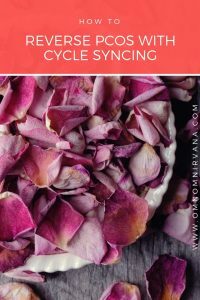 “At the heart of cycle syncing is knowing which foods to consume at each phase of the menstrual cycle. Here is a general idea of the types of foods you would eat and when. Seed Cycling “- A process where you intake certain seeds to bring about hormonal balance during different phases of your cycle. “Yoni Steam” – As awkward as it sounds, its also known as vaginal steaming. It is basically what it says it is and is known to help provide relief from period pain, quick healing after giving birth and more! I’ve never attempted it myself, but its an ancient therapy that you can do in the safety of your own home. I hope you find this article interesting and it helps you in your PCOS journey. Do drop any questions you have in the comments below and I’ll be happy to have them answered.